In a world of ever changing algorithms, trends, and technologies, the marketing landscape can be quite intimidating – appearing as a vast land of uncharted territory to those who are new to its principles. Here at Stellar Blue Technologies, we are constantly looking for new ways to revolutionize the way we do things, and to help our clients “rise above” the competition. At the beginning of 2018, our team sat down and asked ourselves the questions, “what can we do that no one else is offering?”, and “how can we set our clients above the rest?” A team of techy nerds (and quite proud of it), the Stellar crew thrives on all things technology, virtual reality, digital marketing, and innovation; so like a beacon in the night, the answer became quite clear: drones! Stellar Blue Technologies is proud to add drone capabilities to our marketing and multimedia offerings in 2018! You may be asking yourself, “but how can this help me?” We put together our list of the top ways drones are revolutionizing marketing, and how that relates to you! As you scroll through your social media platforms each day, you more than likely are bombarded with photos and videos from brands desperate to try to reach you. So much so, that we become conditioned to them, and they begin to lose their effectiveness. A failed attempt to capture our attention, we mindlessly scroll over them. So how do companies, brands, and organizations reach their audience in such a cluttered space? Disruption. Stand out. Be different. Imagine this. You’re in the market to buy a new house, and you see two house listings: one features a photo gallery of about 10 photos, showcasing the home best features, while the other is video of an overhead view of the home and neighborhood; as well as 360 degree views of the inside of the house. Which captures your attention more? That’s what we call disruptive marketing. Whether you’re selling a product or service, descriptive word choice and quality photo and video are key to helping your target audience to see the value in what it is that you’re selling. At times, it can hard to encapsulate the true value in just a few words or one photo. For example, if you’re a resort hotel that prides itself on being located on a beachfront setting, what do you believe will resonate best with your audience: telling them “we’re located on the shores of a beautiful sandy beach!”, or showing them an overhead view of the beautiful sandy beach? While an excellent writer can capture much of the imagery they desire their readers to envision within their word choice, humans are visual creatures – especially when “money talks.” Showing value vs. telling about value will almost always make your sell easier. Despite drones being relatively affordable, they don’t come without a few obstacles to implement into your marketing program. One must first obtain a license to fly them by the FAA, and although the process is pretty painless, this will detract many from attempting to use drones. But for many, the newness of drones, will simply be too intimidating. This presents a very unique opportunity for all who are interested in become thought leaders, innovators, and marketing extraordinaires. Quite literally, drones present an opportunity for your organization RISE ABOVE the competition with captivating marketing collateral that will draw in your target audience, with stunning views and unique imagery. 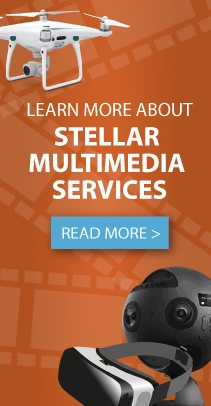 Stellar Blue Technologies removes all of these obstacles for you, as not only do we have the licenses necessary, but the knowledge and expertise to create stellar, attention-grabbing videography. If you’re ready to take your marketing program to new heights, consult with us today. We can’t wait to work with you! In the mean time, check out some of our recent drone video shorts here.